The Partners & Suppliers Charter LACOSTE applies to all employees in the LACOSTE Group so that we can work together while respecting the laws, ethics, and, of course, the values that unite us: being accountable, audacious, collaborative and caring. The principles and recommendations it contains show the path to follow to incorporate fair play in your behavior in the sporting spirit that has been behind our success. The Partners & Suppliers Charter LACOSTE is available in 9 languages. Download the Partners & Suppliers Charter. When René Lacoste adopted the crocodile emblem, he had no idea that 80 years later this logo would be worn by millions of people. Equally, he never imagined that the crocodile could one day disappear. As part of its Corporate Social Responsibility (CSR) mandate, Lacoste contributes to the protection of biodiversity worldwide through its involvement in the preservation of crocodiles, alligators, caimans and gharials, as well as the protection and restoration of the ecosystems in which these animals live. The LACOSTE CSR policy aims first at protecting the collaborators, the working tool and the brand: the Partners & Suppliers Charter LACOSTE clarifies our rules of the game and makes sensitive the collaborators in the CSR stakes. Fibers, including cotton used in LACOSTE polos respond to high demands that beyond the standards of quality, must also register in accordance with the principles of sustainable development. LACOSTE ensures use cotton did not come from sources at risk in terms of respect for human rights. In this way, LACOSTE supports the RESPONSIBLE SOURCING NETWORK and the CAMPAIGN COTTON PLEDGE fighting against the forced labor and the child labor in cotton fields. 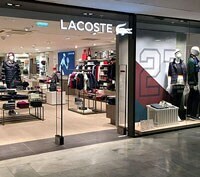 LACOSTE is a member of AFIRM Group, a working group comprising several global brands committed to respecting the controlled use of chemical substances indispensable for the manufacture of clothes, leather goods and shoes. LACOSTE supports the Cotton Pledge campaign launched by the Responsible Sourcing Network, which fights against forced labor and child labor in cotton fields. By 2020, all the LACOSTE design and relevant product teams will be trained on circular fashion and eco-conception. With more than 1,200 points of sale around the world, LACOSTE pays special attention to the energy consumption of its stores. On this ground, the brand has opted to work on the integration of environmental criteria in its store concept these studies relied particularly on the realization of LCA, analysis of Life Cycle, allowing to work primarily the lights and air conditioning.